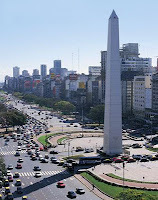 Faraway Pillow: A Day in Buenos Aires- Que Rico! Slow step, slow step, quick, quick, slow… as I dance the basic tango steps with a handsome Argentine I note the novelty of the moment. On the small Bar Sur dance floor we dance the sultry tango to ‘Por Una Cabeza’ played by the band. Three days into my trip to Buenos Aires I make a strong connection to the city through the dance that it’s so famous for. 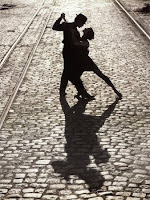 Buenos Aires is like the Tango, it is sophisticated, romantic, slightly melancholy and undoubtedly seductive. Part of the seduction is the glamour that the Buenos Aires possesses. This eccentric city is a glamour capitol of the world. You’d be hard pressed to find more glamorous people anywhere. The wide-ranging music, the eclectic architecture, the worldly cuisine, the paramount fashion scene, the provocative art, and the diverse people are sophisticated. Buenos Aires is a city of contrast with a variety of heritages that create a unique and urbane style. Ninety percent of the current population is of European descent. Like the Tango, the glamour and elegance of this cosmopolitan city’s European roots are interwoven with its undeniable Latin American essence. Buenos Aires, European yet Latin, is a land of contradictions. Although one of the world's most glamorous cities there is a substantial amount of grit. Augustín, my dance guru, teaches me that like the melancholic origins of the Tango, a dance that expresses the grief, pride, and struggle of immigrants of the late 19th and early 20th centuries, Argentina has experienced its share of gloom. Argentina was one of the world’s wealthiest countries 100 years ago, but suffered during most of the 20th century from recurring economic crises, which culminated in 2001 in the most serious economic, social, and political crisis in the country's turbulent history. The economy bottomed out in 2002 and left sixty percent of Argentineans under the poverty line. Government measures have since been instituted to correct the failing economy but many are still severely struggling as thirty-five percent of Argentines are still under the poverty line.1 Though Argentines have a zest for life, as I pass one of many men rummaging through garbage, I feel the deep melancholy that surrounds the past decade’s financial woes. Since we arrived we’ve been seeing and doing, trying to absorb everything that Buenos Aires has to offer. Like a series of spins, in which one partner rotates the other, the city seems to be whirling around us. The chaos is everywhere… cars zooming by, hoards of people walking every which way, tango music on side streets blaring out of boom boxes, street vendors selling everything you could ever want or need. After two days of twirling all over the great metropolis, we opt for a slower dance and visit the Jardin Japonés, located in Buenos Aires’ largest barrio (neighbourhood) of Palermo. We are ready for a bit of tranquilo after the hustle bustle and Jardin Japonés (Japanese Garden) is a great place to find our Zen. The image of koi ponds and red bridges, bonsai trees, festive shrines, and pagodas is the perfect stop for a little relaxation. In addition to the breathtaking gardens, my husband and I enjoy an ice cream while canoodling on one of the many benches that over look the koi ponds. It’s dusk on a hot summer night and we’ve just left our hotel after resting up a bit. We take a very cheap taxi to the historic barrio of San Telmo, one of the cultural strongholds of the city. My husband and I approach the Bar Sur, a local nightlife temple that for 43 years has served as a place for residents to officiate their dearest rituals, the ones that identify themselves as Porteños (residents of Buenos Aires). Alluring music radiates from the locked doors of a small, unassuming building. We gently knock wondering if it’s a member’s only club and strategize on how to become members. A man in a tuxedo answers our knock and warmly welcomes us to the intimate bar and live show. He shows us to a small, white linen table cloth covered cabaret table and takes our drink order. We order a bottle of champagne as the occasion feels truly special. I hear the accordion, bass, and piano harmoniously combine to create such charming music, I can’t wait to get up and try to dance. I grew up loving Tango, practicing with my sister and performing for family. We learned by watching the dance scenes in the movie True Lies over and over, trying to emulate the dance preformed by Arnold Schwarzenegger and Jamie Lee Curtis. I giggle to myself thinking after all that practice I could give Ms. Curtis a run for her money. After one of the performances one of the dancers approaches our table. The man is tall, dark and handsome and asks me to dance. I say, ‘I’d love to but I have no idea what I’m doing.’ Agustín replied, ‘a tango virgin, my pleasure.’ He graciously teaches me the basic steps of the steamy dance as I realize what I already knew; you can’t really learn a dance from watching a movie! I had a great time at the Bar Sur and only wish my sister could have seen me in all of my tango glory. I work up quite an appetite with my tango debut and am ready for dinner. We head from the San Telmo neighbourhood to the Palermo Viejo neighbourhood, where we are staying. Palermo Viejo, as the name implies is the oldest part of Palermo, which has exploded with life in the last decades. Houses once used as mechanic’s workshops have become chic boutique hotels, old meat shacks have become cutting edge shops, and cobbled Plaza Palermo Viejo has become a place to see and be seen at the many stylish watering holes. We had our concierge make us reservations at La Cabrera, reputedly the hands-down best parilla (restaurant specializing in grilled meats) in the city. It’s 11:30pm and because Porteños don’t eat dinner until 10pm at the earliest, we’re just in time for the dinner rush. Upon arrival we are served champagne as we wait for our table outside in the make-shift lobby on the sidewalk outside the front door. The sidewalk outside the restaurant is packed full of beautiful people with champagne, also waiting for their tables. All of the sudden the hostess parts her way through the crowd of people with a big plate of house-made sausage, cut into small bits and served with tooth picks. It seems as if we are no longer at this stylish Buenos Aires restaurant but on the African Savannah and this chic watering hole has turned primal. People begin elbowing their way to the plate of sausage as if hungry, wild animals. I begin to make my way to the mouth-watering sausage but as I am ferociously pushed aside by a very skinny Porteña, I decide she needs the morsel more than I do. The interior of La Cabrera is cozy, non pretentious, and casual. The place is packed full of people- the sounds of laughter, chatter, and clinking silverware fill the convivial space. We order a bottle of Malbec, Argentina’s celebrated wine. This particular varietal is from Mendoza a very important wine region to the North. With every sip I can taste the intense fruity flavor and velvety texture. The meal feels decadent and I haven’t even eaten anything yet. Although I know my eyes are bigger than my stomach- I order too much anyway. We share fried olives and marinara sauce, a seemingly bizarre concoction. However, the crispy batter, the briny olive, and the spicy marinara are the perfect combination. 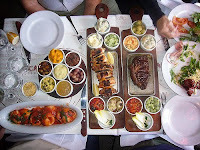 For our main course, we share grilled duck confit and grilled lomo (filet) with an assortment of side dishes and sauces that completely fill the tiny table for two. The chef, Gaston Rivera’s, secret is the quality of cut, the pine wood he uses to add flavor, and of course, the timing. This was definitely the best meal we had on the trip the best meal I’ve had in a long time. It was simple, delicious and unforgettable. After dinner we saunter down the street back to our hotel laughing about how surprising it is that we were able to leave La Cabrera standing. After that much food they must have to wheel people out of there! The warm summer air breezes past my bare shoulders and for a moment I feel bad for my friends and family back home in the snow. The warmth of this metropolis goes far beyond the weather- though sophisticated and glamorous; the people are so incredibly friendly. The Porteños will go out of their way to make you feel at home in their port city. Moreover, the steamy tango heats up the already sweltering summer nights and leaves even the most indifferent onlooker blushing. Though the average Porteño may be financially disadvantaged, Buenos Aires is a city rich with culture, history, cuisine, and absolutely oozes style. Beyond the sensuous tango and world-renowned beef, the dynamism of Buenos Aires makes it the continent’s must-see city. Que Rico! We arrive at the Costa Petit, where we are staying. Formerly a mechanic’s shop, Costa Petit is now an ultra smart boutique hotel. The tool shed is now a luxury super suite and the garage pit is now the swimming pool. The boutique hotel’s 4 rooms sit amidst a quiet haven secluded from the many noises of Buenos Aires’ most happening area. We go up to our room and lay down to sleep in our turned down bed. My head hits the faraway pillow as I fall asleep to the counts of slow step, slow step, quick, quick, slow.